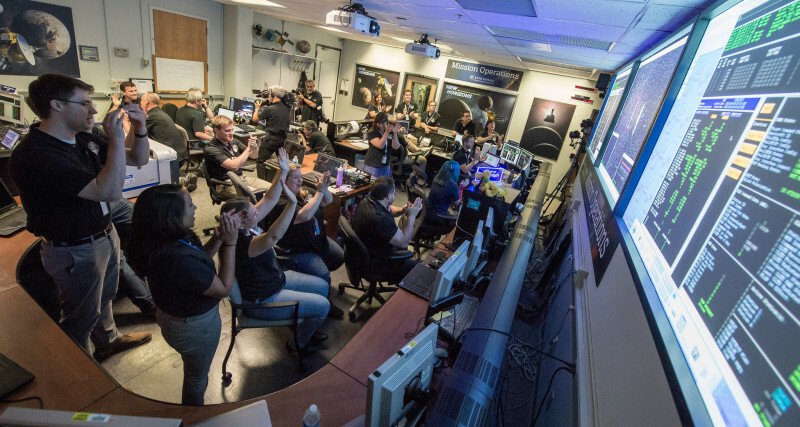 NASA's New Horizons spacecraft has survived its encounter with Pluto and carried out its scientific observations as planned, according to a message received from the spacecraft. New Horizons is now zooming away from the dwarf planet at 31,000 miles an hour. On Tuesday night, the team gathered at the Johns Hopkins University Applied Physics Laboratory in Laurel, Maryland to celebrate. The first images from the probe's closest approach to the dwarf planet and its moons are expected to be released around 3 pm ET at a NASA press conference. The highest-resolution images will take months to transmit over the 3.5 billion miles that separate New Horizons from Earth. NASA expects to release them at a series of press conferences near the end of the year. We'll bring you those first photos as soon as they're available, along with reactions from Bay Area scientists involved with the mission.